JetBlue today announced it intends to launch multiple daily flights from both cities to London in 2021 – the carrier’s first European destination. The new routes, which will be served by Airbus A321LR single-aisle aircraft with a reimagined version of Mint, will mark the first-ever transatlantic service offered by the award-winning airline. JetBlue is evaluating which London airports it will serve. JetBlue announced it intends to launch multiple daily flights from both cities to London in 2021. Known in the U.S. for having the most legroom in coach, live television at every seat, free Fly-Fi broadband internet, complimentary snacks and soft drinks, and great customer service, JetBlue’s entrance into the transatlantic market will introduce a new era of customer-focused, low-fare travel for both leisure and business travellers. The airline’s Mint premium experience, which disrupted transcontinental travel in the U.S. with accessible fares and a thoughtful reinvention of the business class cabin, promises to offer transatlantic customers a fresh choice. Growth into Europe is the next natural step in JetBlue’s focus city expansion strategy, with London being the largest destination not served by JetBlue from both New York and Boston. 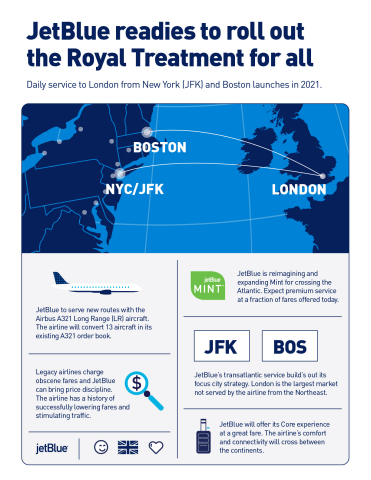 The new service will strengthen JetBlue’s relevance in its two largest focus cities while also answering calls from loyal business and leisure customers who have, until now, been forced to fly other carriers to and from London. The highly anticipated announcement, which comes after an extensive internal review, was made today in New York at a crewmember event at John F. Kennedy International Airport. More than 1,300 crewmembers filled the airline’s hangar to hear CEO Robin Hayes and President & COO Joanna Geraghty outline the historic move for the 19-year old airline. Hayes is set to deliver the keynote address tomorrow at The Aviation Club of the U.K. in London in which he will discuss today’s announcement, as well as address competition concerns and airport access challenges in Europe. Travellers flying across the North Atlantic between the northeast U.S. and London have long faced sky-high fares – particularly in premium cabins – or mediocre service in a market effectively controlled by legacy carriers and their massive joint ventures. Alternatively, a handful of low-cost carriers have attempted to enter with a no-frills, bare-bones approach to flying offering little in the way of complimentary amenities or the kind of service that JetBlue has become famous for in the Americas. Particularly in Europe, JetBlue will raise the bar on what travellers can expect from a low-cost carrier. JetBlue – which has been awarded again and again over the years for its commitment to onboard comfort, complimentary amenities and customer service – will bring an all-new choice to travellers with affordable fares combined with an onboard product and level of service that can’t be matched. JetBlue is developing a reimagined, transatlantic version of its premium Mint product which will feature more lie-flat seats than currently offered on the airline’s existing A321 aircraft. Transatlantic Mint product features and design elements, combined with JetBlue’s specially trained Mint inflight crewmembers, will create an intimate and exclusive travel experience. And like its transcontinental Mint business model, JetBlue will offer the elevated flying experience for a fraction of what other airlines are charging today for premium seats. “The success Mint has had on driving down the exorbitant airfares that our competitors were charging, stimulating new demand, and forcing the entrenched carriers to up their game, is a big reason we believe London is the next natural market for JetBlue to be successful and make a positive impact on consumers,” said Geraghty. JetBlue is also creating a new long-haul version of its much-loved core experience. The airline’s customers in the Americas have long enjoyed spacious and comfortable seating, live television, high-speed Fly-Fi broadband internet, friendly service, and much more. JetBlue’s transatlantic core offering will be designed for customers who already know and love the JetBlue experience as the airline remains committed to being an industry leader in comfort and service. The A321LR will allow JetBlue to tap into new long-haul markets that were not previously accessible with its current single-aisle aircraft. JetBlue will initially convert 13 aircraft in its existing A321 order book to the LR version with the ability to convert more. This conversion does not impact JetBlue’s external financial commitments or represent incremental capital expenditures as the current order book remains the same. Furthermore, JetBlue remains committed to delivering earnings per share between $2.50 and $3.00 by 2020. This update to the fleet plan is part of JetBlue’s vision to continue improving its earnings per share beyond 2020. Today, JetBlue serves nearly two dozen countries. The airline has been flying internationally for nearly 15 years with a significant portion of its operations in the Caribbean and Latin America with flights reaching as far south as Ecuador and Peru. Unique to European expansion plans, JetBlue has created an internal team to begin the certification process for ETOPS, which permits extended operations for two engine aircraft over water. Additional details about specific schedules, when seats will go on sale, as well as more information about transatlantic Mint, Core and much more will be announced in the coming months. There are a few online signs that U.S. carrier JetBlue is going to launch flights to London and Paris. First, the low-cost airline tweeted a very cryptic sentence: “Blue has always been our favourite colour and we’ll never apologise for that.” Then, Lucy (Instagram @lucysweets09) posted a cake she created on Instagram mentioning: “Luggage cake specially made for Jet blue airline company, I’m so excited about this cake“. On the cake, you can clearly spot stickers of London and Paris. Blue has always been our favourite colour and we’ll never apologise for that.